In 1893, the sisters of Notre Dame opened St. John the Baptist School to educate the children of the parish. Today St. John School continues to provide a quality, Catholic education for students in Preschool through Grade Eight from our parish and several other North Shore communities. 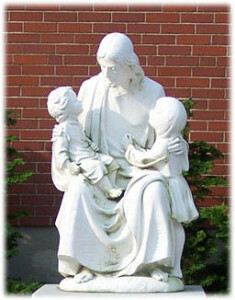 The philosophy of St. John's stresses the development of the whole child, the nurturing and strengthening of the gifts of faith and intellect and the development of social responsibility. We, at St. John School, are committed to educating our children to be men and women of faith, not only aware of the world in which they live, but also prepared and motivated to improve the world for all people. Faith, and the growth of our relationship with God, demands both the teaching of Catholic doctrine and the experience of a faith community. We strive toward the development of the faith community, not only as a concept to be taught, but also as a reality to be lived. Intellectual achievement is the reason for any school to exist. At St. John School we respect the developmental stages and learning style of each child to create an atmosphere of success that cultivates a positive self image and allows each child to grow spiritually as well as academically. We expect, encourage and applaud each child's best work in order to effect the full development of his or her potential. As a parent at St. John School you are in a unique position to really get involved in your child's education. All families are required to donate a minimum of fifteen hours of their time each school year. Families are urged to put some of these required hours into committees that are formed for school events. Parents are able to fulfill this requirement in a variety of areas. We welcome you to take an active role, not only in your child's future, but also the future of St. John the Baptist School. Saint John the Baptist School is dedicated to providing a quality Catholic education that encourages its community to be life-long learners and leaders, to live their faith with high moral standards, and to grow academically, spiritually, and socially.